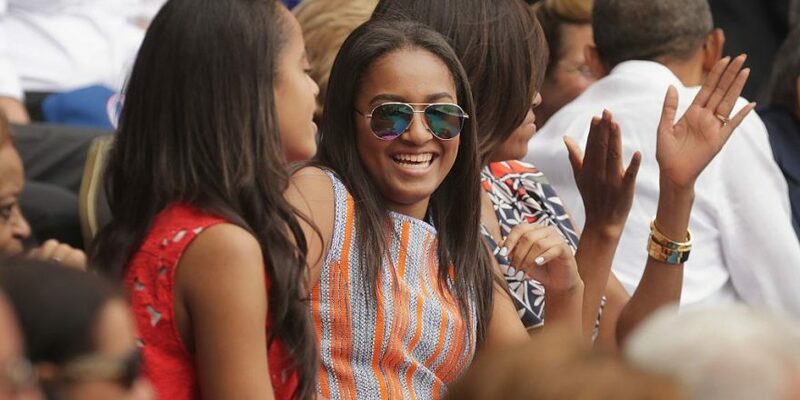 While her older sister finishes up her first year at Harvard, Sasha Obama is holding it down in Washington, D.C. The 16-year-old high school junior was spotted at Broccoli Festival last weekend with a group of friends, where she reportedly watched musicians H.E.R. and Daniel Caesar perform at the festival. Her festival outfit—a white crop top over jeans, white Adam Selman sunglasses—was on par with this summer's trends, but when it comes to hair, Obama may have set a new criterion for this summer's coolest color. Forget millennial pink or gen-z yellow; rather than hopping on board with the blonde or pink hair trends, Obama opted for something that blends in a little easier with her natural color. Blink twice and you might miss it, but the daughter of the former POTUS dyed the ends of her hair with a dark blue hue. A closer glimpse of the blue hair can be seen on Daily Mail's website, as photographed by Dee Dwyer. While Daily Mail acquired quotes from sources who insist Obama was "partying," noting a plastic container filled with an unspecified drink that made one of her friends "wince," and feigning shock at Obama's presence at a festival where attendees were drinking and smoking, nothing scandalous went down with the daughter of the former President of the United States. Ever since her sister, Malia Obama, was photographed smoking at Lollapalooza in Chicago in 2016 (and later attended the Made in America music festival in Philadelphia wearing a tongue-in-cheek homemade t-shirt that read "smoking kills"), the Obama sisters have mostly kept out of the spotlight. Obama and her friends are just a group of regular teens who enjoyed themselves at a music festival, with the only truly notable moment of the weekend (besides Obama's new hairstyle) being the backstage photos of the teen with hip hop's power couple of the moment. She was welcomed backstage as a special guest of festival performer Cardi B and her boyfriend Offset, as she was photographed hanging out with the rappers. Forget the Migos—this triumvirate is probably the coolest trio to ever hit Washington, D.C.